​Scientists need to eat too! Visit The Café, located on the lower level of Great Lakes Science Center. See spectacular views of North Coast Harbor as you enjoy delicious meals and nutritious snacks, including oven-baked homemade pizza, hand-crafted sandwiches, homemade soups and seasonal salads. Burgers, chicken tenders, hot dogs and fries are always available as well! Don’t forget to stop at the Cleveland Clinic DOME Theater concession stand located on the main level for fresh popped popcorn, theater candy and assorted beverages. Monday-Friday 10 a.m. to 2:30 p.m.
Sunday Noon to 3:30 p.m. Looking for a fun gift or an educational toy for the science fan in your life? We’ve got it! 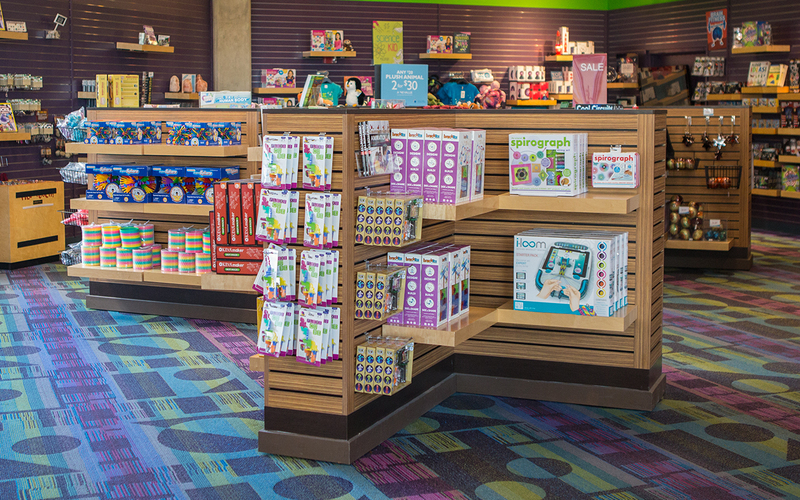 Shop at Great Lakes Science Center’s gift shop and discover a unique array of science-themed books, toys, games, jewelry, clothing and much more! Browse through our selection of merchandise related to our Cleveland Clinic DOME Theater films and current special exhibitions. We always have something new! Visit our online store here! Contact Us Call 216-696-5575 between 10 a.m. and 5 p.m. It's never too early to start dreaming big! Astronaut onesies are now available!